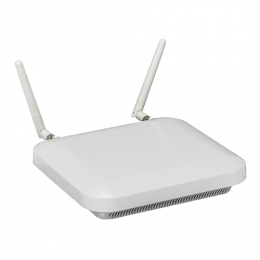 The AP7522E access point delivers 802.11ac speeds at half the cost of many of its competitors. With the comprehensive feature set, 2X2 MIMO and greater speeds than 802.11n, you can provide all your mobile users with the dependable wireless connection they need to stay on the move and productive. Thanks to WiNG Express architecture, integration is particularly simple to realize, even for those who are inexperienced with Wi-Fi. The quadrature amplitude modulation QAM gives the 802.11ac radio a performance boost, and works hand-in-hand with MIMO technology to boost the 802.11n radio to 802.11ac speeds. The dual 802.11ac and 802.11n radios provide support for virtually any mobile device within the 2.4 GHz and 5 GHz frequency range. With these high-powered radios, youll need fewer access points, delivering maximum speed at a minimum cost. The variants with internal antennas have a sleek, understated look which is at home anywhere in your environment - including public spaces. Optional external antennas ensure maximum range for coverage in challenging areas, such as the warehouse or production line. Zebra antenna - Dual band, direct mount indoor dipole antenna with RP-SMA connector, color: White.